Right from the start the 6th-seeded ’10-’11 Hurricanes took control of the series. In Game 1 they scored twice in the first period on their way to a 3-2 as they held on late after Eric Staal scored the game-winning goal on the PP at 8:42 of the third. Goalie Cam Ward stopped 52 of 54 shots against to help lead the ’10-’11 Hurricanes and he would do so all series. In Game 2, they trailed the top-seeded ’05-’06 Hurricanes 2-1 after the second period. However, Tuomo Ruutu scored nearly halfway through the third period to tie the game and eventually force overtime. Then, just 41 seconds into OT, Staal scored to give the ’10-’11 Canes a 2-0 series lead. Two goals from Rod Brind’Amour in Game 3 led the ’05-’06 Hurricanes to a 3-1 win to get on the board in the series. Ward stopped 47 of 48 for the top seed in the win. The ’05-’06 Hurricanes led 3-2 after the first period in Game 4, but the ’10-’11 Canes scored twice in the second to turn it around and take a 4-3 lead into the third period. Brind’Amour scored almost two minutes into the third to tie the game for the ’05-’06 Canes. Then, almost four minutes later, Erik Cole gave the ’05-’06 Canes the lead, again. Just a minute and a half later, Ruutu notted the game right back up for the ’10-’11 Canes. It remained tied until a minute and a half left when Jussi Jokinen scored his second of the game and gave the ’10-’11 Canes a 6-5 lead. They would hang on in the final minute and a half to take a 3-1 series lead. Just like in Game 5, the ’05-’06 Hurricanes led after the first, but the ’10-’11 Hurricanes flipped it in the second. However, Ray Whitney scored late in the second to have the game tied at four going into the third for the ’05-’06 Hurricanes. Then, just about four and a half minutes into the third, Brandon Sutter scored to give the ’10-’11 Canes a 5-4 lead, which would be the final as the upset was completed. 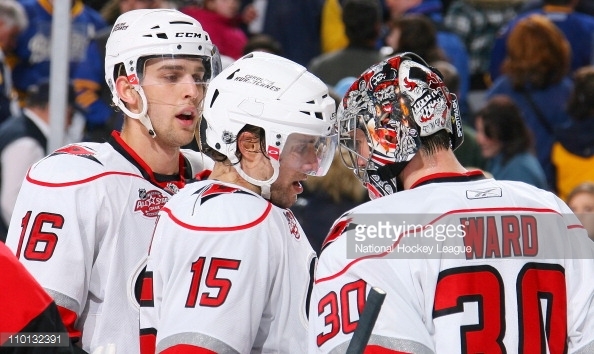 The top seed outshot the tourney champs 59-35 in Game 5, but Ward posted 55 saves to lead the ’10-’11 Hurricanes to the Ultimate NHL Playoff. The ’10-’11 Carolina Hurricanes are the 34th team to qualify for the upcoming 2015 Ultimate NHL Playoff. It will be their first trip to the tournament and they are the 14th team that will make their debut in the upcoming 2015 Ultimate NHL Playoff. Up next is the 2015 Carolina Hurricanes Qualifying Tournament! This entry was posted in Qualifying Tournament, Ultimate NHL Playoff and tagged Brandon Sutter, Cam Ward, Carolina Hurricanes, Cory Stillman, Eric Staal, Erik Cole, Jussi Jokinen, Matt Cullen, Qualifying Tournament, Ray Whitney, Rod Brind'Amour, Tuomo Ruutu, Ultimate NHL Playoff. Bookmark the permalink.